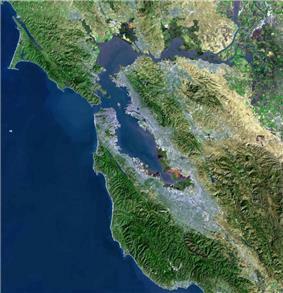 Coast Guard Island is an artificial island in the Oakland Estuary between Oakland and Alameda, California. It is home to several major United States Coast Guard commands and cutters, including the Coast Guard Pacific Area. From 1942 until 1982, the island was the site of the Coast Guard's recruiting training center (boot camp), enlisting and training hundreds of thousands of Coasties including many of the 214,239 who served in the Pacific and European Theaters of World War II. After the war, Government Island remained a Coast Guard Training Center with addition of the Weather Bureau, Internal Auditors, and the Bureau of Roads. During the late 1960s the Training & Supply Center was the Coast Guard's largest field unit on the West Coast. The Training Center graduated 60-100 seaman and fireman apprentices each week. The Supply Center provided support to the western area districts including Squadron One and Squadron Three in Vietnam. The cutters TANEY, GRESHAM, and BARATARIA were homeported on the island at the time. In 1982, the Training Center was closed and recruit training was accomplished exclusively at Coast Guard Training Center Cape May in New Jersey, where it remains today. 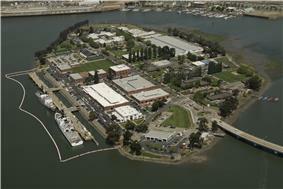 Support Center Alameda was established June 1, 1982 and the island was renamed Coast Guard Island. The Coast Guard Pacific Area, Coast Guard 11th District, and Marine Safety Office San Francisco moved from downtown San Francisco to the island. On June 24, 1987, Maintenance & Logistics Command Pacific was established and located on the island until its decommissioning. The Support Center was redesignated as Integrated Support Command Alameda on March 15, 1996, and today is Base Alameda.